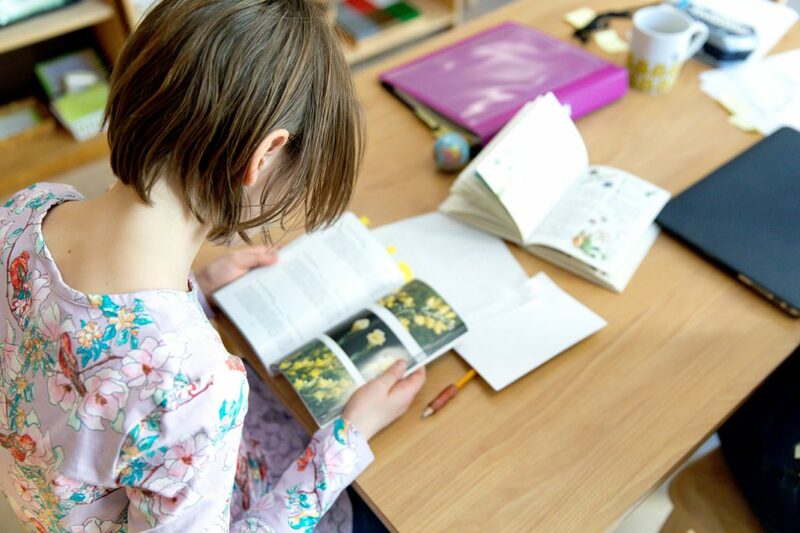 The 9- to 12-year-old class also contains Montessori materials — particularly in the areas of mathematics and geometry — though the emphasis at this level is on more abstract thinking. Below is a list of concepts that each student will acquire during the second three years of the complete six-year Elementary cycle. Common Fractions – equivalencies and comparison of fractions, improper fractions, prime numbers, etc. Graphs, Charts, Measurement, and Problem Solving – standard and metric measurement, reading and creation of graphs, etc. The Upper Elementary language curriculum has several strands, each of which plays a part in a student’s ability to use language as an effective tool for communication. One goal of the language curriculum is for students to better understand the grammatical shape of our language. A second goal is for students to learn the mechanics of written English. A third goal is to practice the processes of gathering, ordering, paraphrasing, and communicating information in a number of formats. Mechanics Concepts – advanced capitalization, advanced punctuation, further study of spelling rules, etc. The broad goal of the cultural curriculum is to help children understand how the world has come to be as it is and to help each child determine what his or her place may be within the larger scheme of civilization. 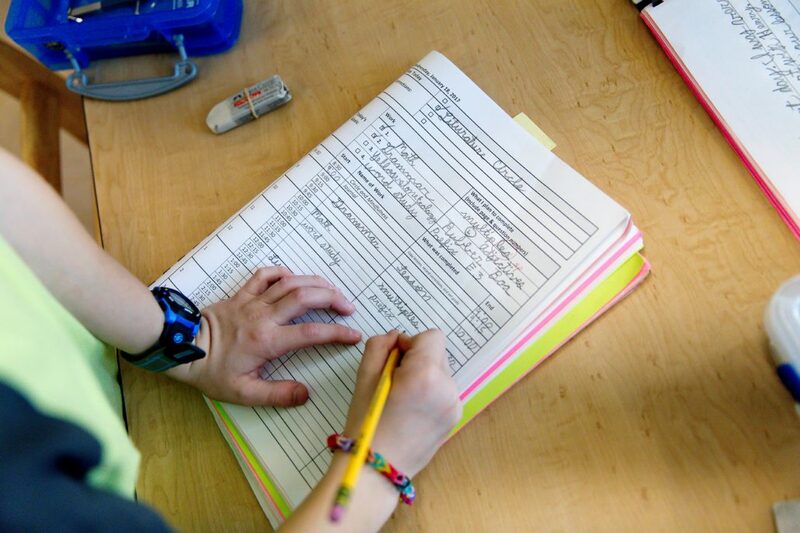 Students also examine their own responsibilities as citizens of this world. The study of biological and physical sciences comes directly from the three states of matter: solid, liquid, and gas. Solids – experiments in simple physics, properties of solids, skeletal/muscular systems, soil profiles, etc. Liquids – experiments in simple chemistry, properties of liquids, water quality, water conservation, etc. Gas – astronomy, properties of gasses, global wind patterns, Earth’s atmosphere, weather patterns, etc. The art studio exploration for the 9- to 12-year-old child is geared towards strengthening creative problem-solving skills through both two-dimensional and three-dimensional spatial concepts. Through media experimentation, concepts are explored in more detail and sophistication. The studio atmosphere also encourages cooperative learning. The students will be exposed to a variety of media, including colored pencils, charcoal, graphite, chalk and oil pastels, watercolor, acrylic, and oils. The projects explored in the art studio are primarily criteria based, with the application of specific skills and concepts as a goal. There is always room for individualism and creativity within a given assignment as each child is unique in his or her approach. 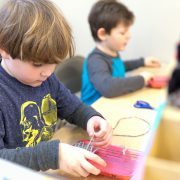 The Montessori approach strives to give children an awareness of the interconnected nature of their studies to the world around them. It is the goal of the art director to integrate his or her program into the core curriculum. The goal of the music program is to install a joy of music by incorporating the following: exposure to all forms of music, singing, listening, ear-training, movement, instrument playing, and creativity with the use of drums, traditional rhythm instruments, and the recorder. The Upper Elementary physical education program continues to build on the goal of instilling a love of movement and physical activity. Group activities that focus on gross motor skills, coordination, spatial relations, fitness, and strength are combined with advanced games utilizing equipment such as balls, flags, cones, paddles, racquets, and targets. Sportsmanship and competition are encouraged with core Montessori principles such as grace, courtesy, and respect in mind. Students continue to use the “PE Shelf,” which allows students to choose independent PE work. School Hours for Upper Elementary (4th through 6th grade equivalent; approximately 9-12 years old): 8:10-8:30 a.m. drop-off; 3:30 p.m. pickup. After School is available until 5:30 p.m.